It’s important to build your vocabulary. It’s also good to have your high school diploma or an equivalent like the GED. If you’re interested in getting your GED, there are classes offered now, free to many, at the Academy North Building, 712 N. Academy Street in Guymon. To find out when the classes are, if you qualify for free classes, and other questions you might have, call 580-349-1552 to speak in English and 580-349-1538 to speak in Spanish. Be brave. If this is something you want, you can do it. You need to try! The Super Bowl was a bit of a snoozer. Watching the game with me was a former OPSU football team captain, current OPSU player, a high school assistant football coach who played in college, and my daughter. Sitting there, I knew this was a time to be quiet. Pretty sure my football knowledge and opinions were subpar in the room that evening. Yep, time to be still and keep my opinions to myself. I’ll just get another piece of pizza and watch the game. Shop and Dine takes place on Thur., Feb. 7 from 4 to 7 pm. Go by Golden Crown, Merle Norman, Top Hand Western Store, SPC, and others and enjoy the snacks and drinks. You’ll have fun and you will probably find something awesome that you will want to take home! Shop small on Thursday. Support those who support our community activities … including the school groups and programs. We need to be aware of those who are giving back. Speaking of giving back, those who came to the City Council meeting for the conversation and presentation on Main Street Guymon funding, you are very appreciated. That there were so many who would take time out from their busy lives to attend the meeting really humbled my board and me. Giving of our time is something that is really special. And those who spoke, I could tell that wasn’t something they really wanted to do, but they stood tall and did it anyway. I love our partners and I love working with people who are so unselfish and giving. It was a good conversation and I’m feeling that the Main Street Guymon Board and the City Council will continue working together. We’ll see … don’t stop saying prayers for both groups and that we will listen to one another and have our eyes and ears open during the talks. At church last Sunday the readings spoke of love. After the Council meeting, it was a subject that fit. When you are doubting whether you’re in the right place, doing the right thing, it is good to have affirmation and let go of the doubt. Then you can get back to work. But the Pastor talked about giving and helping others. You shouldn’t walk past your neighbor who is in need to go to church. This really tugged at my heart. We need to take care of our neighbors, whether it is spending time with them, taking them groceries, or helping them plant flowers. And then our church took an offering for the Oaks of Mamre. It was so appropriate after the sermon. It is a constant struggle to not get so wrapped up in our busy days, our list of things to do and things we want, that we don’t see our neighbor who needs a hand. But we can remind one another and we’ll get better at it! The City Council meeting reminded me, church reminded me, and now I need to keep my eyes and heart open. Our neighbors have a lot of different accents here in the Panhandle. Some of those neighbors are from Africa and have been living here in Guymon for about ten years. We’re going to have a Know Your Neighbor afternoon at the Guymon Public Library on Feb. 24. That’s a Sunday from 2 to 4:30 pm. We’ll watch a documentary on the Lost Boys of Sudan, then hear the story from three Lost Boys who live here in Guymon. The end of the meeting will be time for questions and answers. It’s a good time to learn more about our neighbor. “I’m just here to establish an alibi.” Wow. Read that on a shirt and it made me laugh so hard. But I honestly don’t think that I would buy the shirt for anyone. There are two other events taking place on Feb. 7 besides the Shop and Dine. The Chamber’s Excellence in Ag banquet is at Pickle Creek starting at 6 pm and is a wonderful evening focused on agriculture in the Panhandle. Also, that evening is the Perfect Pairing fund raiser for the OPSU Business Club and Computer Club. A great group of students and teachers who represent the Panhandle so well. So, you have your choice … go shop a bit and then had to one of the evening events, you can go the way of the land or the way of technology. Both are going to be excellent. One last thing to put on your calendar is a conversation on Recycling, led by the Rose Garden Club members. 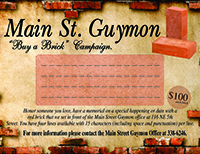 This is Sat., Feb. 9 from 10 to noon at the Main Street Guymon office, 116 NE 5th Street. Come and hear the ways that we have in Guymon to recycle. We need to take care of our land and not trash it. Oh, let me close with this last saying that is a hoot, “Synonym rolls, just like Grammar used to make.” Now, admit it, that’s funny right there.